The giving of alms is not charity to the monks, but a way for a lay Buddhist to make merit by and show respect to the monks. The monks are living from what the people provide, it forms a connection between the people and the monks. 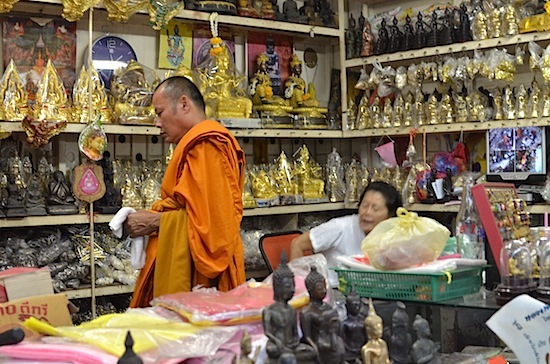 The monks are not begging for food, the monk shows humility and detachment from worldly goods. The monks are not sitting on the streets idly begging with open bowls, alms are given in the early morning and the monks walk slowly and people that want to give them food indicate this to a monk. The giving of alms is a simple process, even for someone that doesn’t speak Thai. I would simply raise the small bag of food (rice, curry, fruit, water) up to about my waist height when I saw a monk coming down the street. The monk would stop, open his almsbowl and I would place the package of food in the bowl. The monk would then say a few sentences to me in Thai- this is a teaching for me; while the monk is doing this you fold your hands in prayer about chin height. It is common for people to remove their shoes and kneel in the street, in front of the monk for the giving of alms and the words shared by the monk. There is no touching or other interaction between the Monks and people, this is not a social visit and there is not small talk. It all happens very quickly. It is a bit different when a woman is giving alms to a Monk, women cannot touch monks in any way and women generally kneel in front of the monk on the street. The monks take the food they have collected in their almsbowls back to their Wat and share it with the Buddhist community. The monks eat two times a day, when the monk returns he will choose some of the goods collected in the almsbowl for his morning meal and leave the rest for the nuns and staff and for other monks that could not go out for alms. Almsgiving happens every morning- early. Generally it is best to go between 5:30 and 8:00 as the monks return to the Wat for study and do not come out for the rest of the day. Loads of culture, history and new age infused into one. Charoen Krung Road was the first road to be built in Rattanakosin or old Bangkok. It was built in 1861 during the reign of King Mongkut or King Rama IV when foreign consuls petitioned for a road to be built. Charoen Krung (ถนนเจริญกรุง, Thanon Charoen Krung)) is a major road in Bangkok that runs roughly parallel to the Chao Phraya river. Part of it is considered Chinatown along with Yaowarat Road, part of it is closest major road toPhahurat (Little India), its northern terminus is the Grand Palace, it runs through Nakhon Kasem (Thieves Market) and Khlong Thom Market (low cost electronics). Bangkok's oldest theatre, Sala Chalermkrung Royal Theatre, as well as Bangkok's Central Post office, and State Tower are on the road. South of Taksin Bridge is mostly residential except for the Wat Yan Nawa. Wang Lang market is well-known among Thai people especially to nurses and Thai university students who often visit this market to relish delicious dishes. Wang Lang market was named after reputed politician Wang Lang also named as Jingxing. He was a minor warlord during late Eastern Han Dynasty. After the fall of the Han Dynasty, he became a politician in the Cao Wei state. 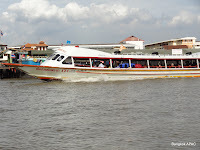 The market is located near Siriraj Hospital along Chao Phraya river. mold. Kanom buang maprow are crispy wafers filled with meringue and salty dried shrimps or sweet coconuts. They are available in small sizes but their taste is great. You can also enjoy roasted pork, muu daeng yang, served at several places just to the left of the ferry pier. Tourists can order a plate of ‘baame muu daeng heng’ containing springy wheat noodles studded with chopped scallions and chunks of roast pork. Southern food is hard to find but many stalls along the south of Phran Nok road serve it. You can ask for Try phad sataw muu tawt. It is made from delicious stink beans stir-fried with crispy fried pork belly. You enjoy a wonderful taste of the sataw beans cut through the fat of the pork beautifully. At Wang Lang market, you can easily purchase brand name products such as Prada, Lacoste, shoes, bags, dresses and vintage products. You can also buy second hand clothes. If you are good at bargaining, you can buy many top quality products at an extremely cheap rate. How do you get to Wang Lang Market? New to town? view Bangkok Novice to Advanced, multiple search engines.